The one-bed apartment looks out onto the decking and waters from Lake Tarpon, the second largest lake in the state of Florida. It is located at ground level with an allocated parking space almost right outside. 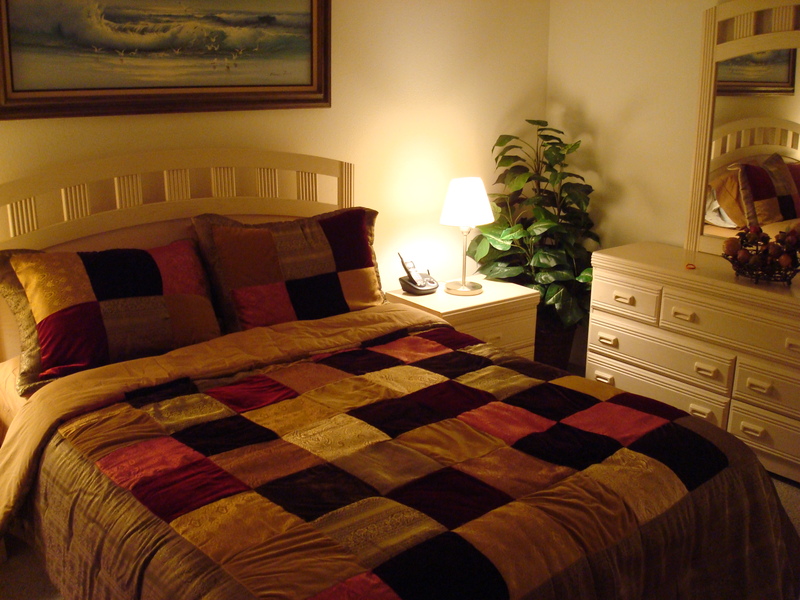 It is very spacious and has one bedroom with queen size bed. The apartment is comfortable, clean and above all safe. It is air-conditioned and family-friendly with high-chair and travel cot. The approximate size of the apartment is 800 square feet. We have a phone with free local calls and an actual computer (we have a computer desk and comfy office chair) with free high-speed Internet. Alternatively bring your cellphone, laptop or other device and pick up our wireless signal. Having the free high-speed Internet is so handy for staying in touch with the world, checking the weather, checking your emails, looking up local information, playing CDs etc. 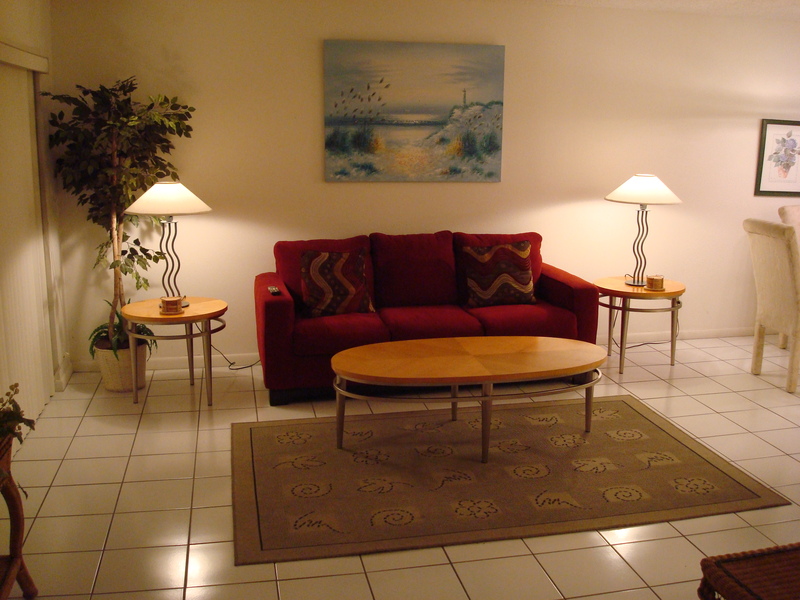 The living room and dining area have a superb view of the water of Lake Tarpon lapping at the decking. This is a major factor, not to be underestimated – we have had people who have stayed in both apartments and many prefer the one-bed. It is really a case of how many people are in your group as the two-bed is much more spacious and of course sleeps more. The view outside is fantastic especially at night when the palms are all lit up. 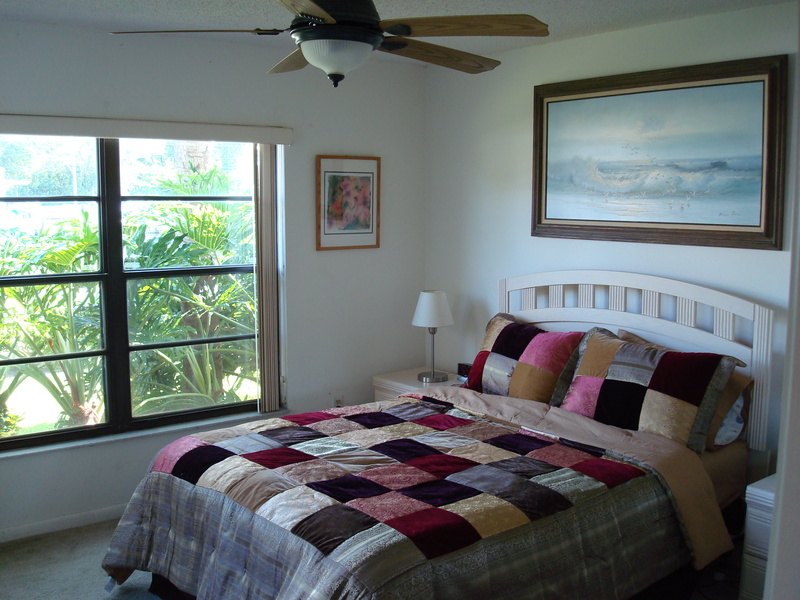 Patio doors in the living-area open up into the lanai – this is a large area with a table and chairs which although ‘outside’ is fully screened in to keep any insects out. It is a great place to sit out with a cool drink at sunset just enjoying the waterfront views. When you go though the door in the lanai, you step directly onto the decking of the apartment complex and there is a bench right outside to sit on. Often you will see storks and herons right outside. By the bench on the decking by the water we have a gas grill BBQ for your use. The large sofa bed in the living room enables you to sleep four with ease. The living room has a sofa for three and a separate sofa for two. The TV comes with free Cable TV with over 80 channels. We also have a VCR and DVD player for movies (it also will play CDs). Queen-sized bed. It also has a large wardrobe and lots of drawers providing plenty of space to store all your belongings. Bedding is provided and we have a hairdryer. The dining area has a dining table with seating for four. The kitchen has all the obvious appliances and utensils you need for cooking i.e. cooker, microwave, pots, pans, cutlery, kettle, coffee-maker etc. There is also a dishwasher and refrigerator. In the hallway is a washer/dryer, iron and ironing board. Next to the bedroom is the bathroom with bath and shower. Towels are provided. WE ARE EXPERTS AT THIS! You will find everything you need for a fantastic relaxing holiday or vacation. We have been doing this for over 10 years now so we know you will love it here…and don’t take our word for it…read previous guests comments here.